We have to be careful when documenting today for today's documents might not be accessible tomorrow. Technology advances so quickly these days, compared to times gone by. If digital documents aren't printed who's to say we'll be able to view them in the future? As a youngster just two decades ago, I had a Commodore 64 computer with cassette tapes and 5.35 inch floppy disks. I no longer have any facilities to access any files I may have had on those tapes or disks. I still have a box full of 3.5 inch floppy disks which I used 10 years ago in college, but the laptop I'm using to write this doesn't have the means to use them. I have film cameras and digital cameras, but no matter which format I use, I make sure I develop/print the pictures I want to keep and/or pass on. 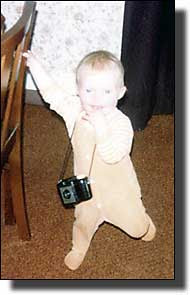 I'd be devastated in years to come if I realised I could no longer access precious photos or documents because technology had moved on. As family historians we collect data, documents and photos of our ancestors, but how many of us are documenting our own lives? I'm well aware many of us are writing blogs, but how many of us have our blogs backed-up? A server crash or a breach in security and it could all be lost. I don't entirely trust the digital world and I prefer to have something to hold on to. I admit it... I'm a hoarder! My life will be documented by old concert tickets, memorabilia from a favourite band, old letters, postcards & cards from friends and loved ones, the diary I kept while in college, 3 books of poems and stories written in my teens and early twenties, boxes and albums of photos, and anything else I collect on the way. That will be my life when I'm done. Don't we all wish our ancestors had left us their diaries and noted people's names on the back of photos? Shouldn't we also be doing that ourselves? I take a camera almost everywhere I go. I have film cameras, digital cameras and even my mobile phone has a camera, so I'm rarely without the means to take a photo. Well, you never know what might catch your eye. Why do I take photos? Well, I just like pictures! Not arty shots or anything like that, just what I see. I mainly do it for myself, but I do like to show friends, family . . . Anyone . . . what I see. If I go for a walk I'll take my camera with me. Living in Mid Wales and it's border with England provides me with some beautiful and stunning countryside. 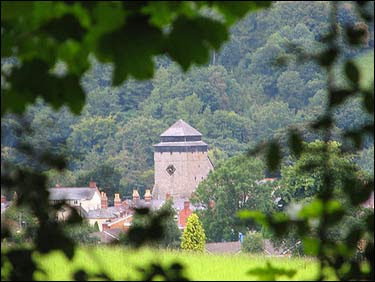 Some of my walks and drives will be on the trails of my ancestors, taking photos of places they may have been. The photos below have been picked out, so I thought I would share a little about each one. My Great Great Aunt Mary was buried in the church yard, so one day I drove up into the wilds of Shropshire to look around the village church yard. For me, the porch stood out as it was different to the church it's attached to. 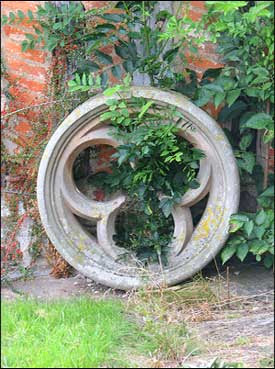 The stone wheel propped against it also caught my eye. 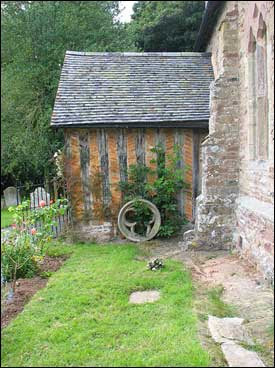 I'm not sure why the stone wheel was propped against the church porch, but there was something about it that I liked. 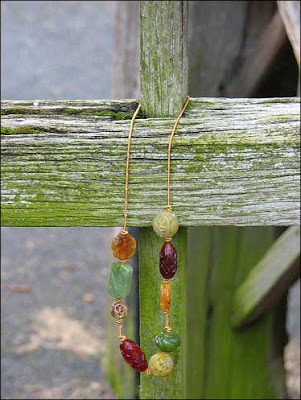 These beads hung on the church gate. I have no idea if somebody of faith left them there or if they were found and left there for their owner to find. Either way they caught my eye. 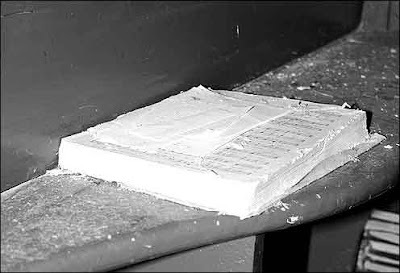 This old music book was left behind in a disused chapel. In years long gone by, my Great great Aunt Doris had played the chapel organ there, so I wondered if this was the book she'd used to read the music. These lambs started to run off as I stood by the field gate, but they all stopped and turned around to look at me so I couldn't resist taking a photo of them all. I see lambs and sheep every day, living in Mid Wales means it's hard not to! Even the village I live in has a breed of sheep named after it! This old bench is a mile or so out of the village at the side of a country road. As a youngster my friends and I would cycle around the "block" (roughly a 3 mile journey from the top of the village, up hills and down, and around and back into the bottom of the village). 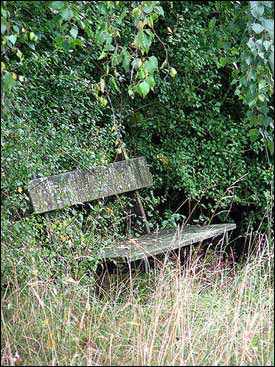 We'd stop at this bench for a rest, but the bushes weren't so overgrown back then. It stands by the bridge just outside the village. On a snowy day when I couldn't get to work, I put on my wellies (rubber boots) and went for a trudge through the snow. This post box stood out against the expanse of whiteness. Not far from the old bench you can find this view of the village, if you can find a gap between the trees. The church stands out above everything else. 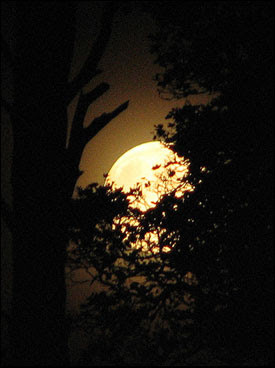 I find the moon and the endless (as far as I know!) space fascinating and beautiful. On a side note - Looking back through the photos it seems I could be a religious person, but that would be more true of my ancestors than of me . . . but that's another story! More of Nikki-ann's work can be found here. Brava! While I agree with you that we must be careful as to what media we use to store data, it seems there will always be some company willing to convert such data in order to make a buck. I have the same problem with Super 8 Video tapes of weddings and family events that I cleaned out of Mom's house. I don't know whether to buy a VHS adapter to review them before having them converted or just converting them into DVD and then dealing with them. A great post. 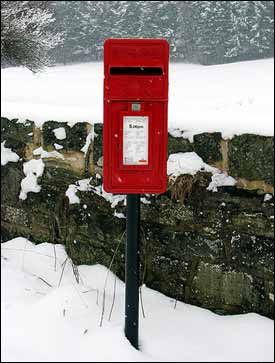 And that photo of the red post box in winter - that is definitely card worthy! Any thoughts of licensing it and others to a stock photography site? Lovely photos, Nikki Ann. You take the kind of pictures that I like to take - ordinary things shown in a different light. Very nice. Thank you for a wonderful post and for contributing to Shades. It's bloggers like you that make this such a rich collaborative work. You have a good eye and your photos are always great. If I printed all of my photos I'd quickly run out of room. I should print some of them now and then but for the most part I store them both on my computer and online. Great article and inspirational photos! Like Thomas, I'm more digitally inclined and I've been able to migrate my digital archives as formats and technologies are updated. Thanks for sharing the view of your world with us. Very well done, Nikki!! As you know, I'm one of your biggest fans of your photography and always love seeing your world. I learned more through this post and I enjoyed seeing photos that I haven't seen before. You are truly one who documents her life and I'm proud of you! Raise the questions so we can decide what is the best course of action to preserve our documented history. That's key, keeping the dialog open. What about a server crash? Scary, indeed!